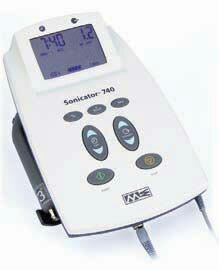 1 and 3 MHz therapeutic ultrasound unit which comes with three interchangeable soundheads. Features a universal applicator cable to make changing applicators quick and easy. Dimensions: 13.5 in (L) x 9.5 in (W) x 7 in (H), (34 cm (L) x 24 cm (W) x 18 cm (H)).